Zingala's Workshop: It's That Time Again! Hi all, welcome! It's a beautiful Fall Sunday morning here and I'm happy to be sharing it with all of you. We are well and truly into Fall now and if the turning leaves and cooler weather isn't a reminder of that, the fact that over at the wonderful blog The Funkie Junkie, Linda has started this year's 12 Tags of Christmas challenge! I love this challenge! Linda creates a tag each week for the 12 weeks before Christmas and to participate you have to find something in the tag design that inspires you. You can find all the details here. By creating all of the 12 tags, or whatever you decide to make, you are entered into a drawing for a gift certificate to Linda's wonderful boutique, The Funkie Junkie. Whether you participate in the challenge or not, you should visit Linda's shop to see all the wonderful products she carries. Now on to my first entry. I decided to cut watercolor paper into 5"x7" pieces and use those in place of tags this year. I'm going to put them all together in a book after the holidays. So, that is my starting point for this first project. My inspiration from Linda's tag was the stenciling and using the stencil to monoprint the background. I started by applying Old Paper, Iced Spruce, and Bundled Sage Distress Stain to my craft sheet and running the paper through it to create a subtle mottled background to knock down the whiteness of the paper. It's very faint and you can't see it well in the picture but it does provide a nice background color for the stenciling. I then stenciled along one side of the card with Gathered Twigs, Bundled Sage and Festive Berries DI. I applied the inks to the stencil again and spritzed it with water, turned the stencil over and monoprinted on the paper. I love the watercolored effect that happens with this technique. I edged the entire card with Gathered Twigs DI and stamped the "Handle with Care" stamp with Festive Berries. I added the die cut banner that was in my stash to the top and used Stickles glitter on the berries. 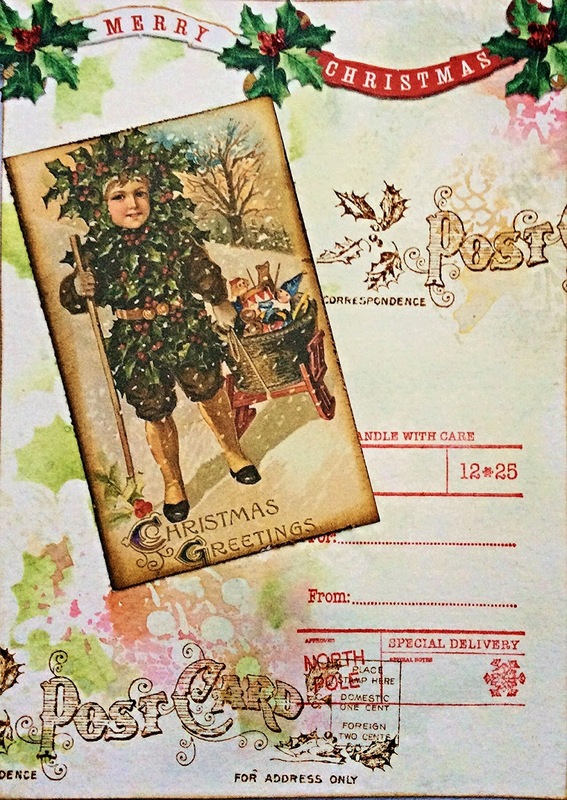 The "post card" stamp is part of Graphic45's Christmas sets from a few years ago and I used Gathered Twigs for that. 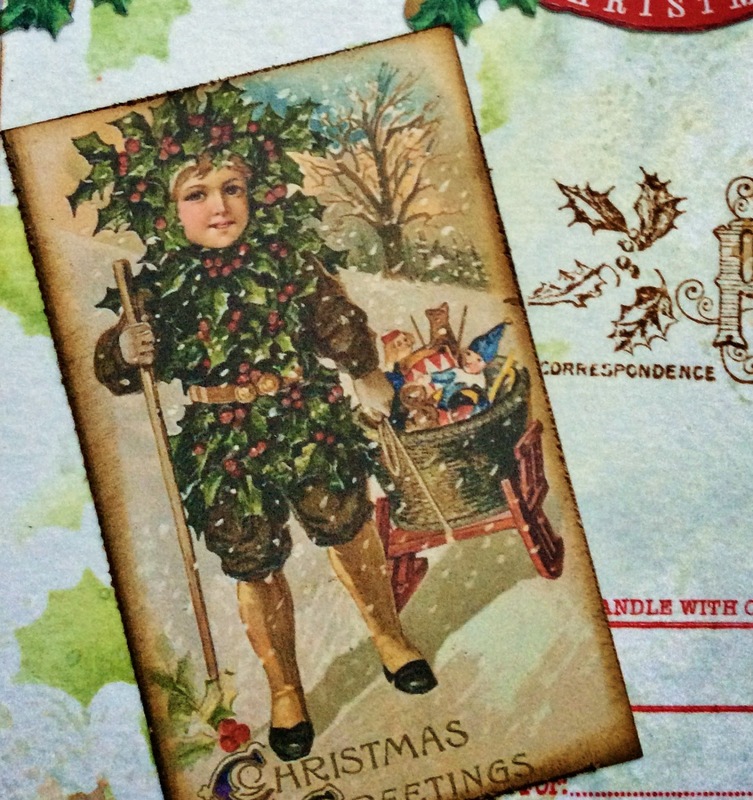 The Holly Boy card is from Kaiser Craft. I loved his costume and his face and I thought it was perfect with the holly theme. Love that watercolor effect. And you can see some of the background color here. ﻿Here is the Holly Boy! Well, there is my first entry for this year! The year is going so quickly, I can't believe Halloween is 3 weeks away and we'll be in the midst of the Christmas season so soon! I love your tags especially the Christmas ones. You have a very good start with this one, there is just something about the Victorian Era. Love his costume, too! And all your special details! I cannot believe you are making Christmas tags already....where did this year go??? I am starting to see Christmas decorations popping up in stores, too. Time just goes too fast! Your tag is beautiful, and the little card you used is delightful - I love it! It looks like such a fun challenge. Yay, Mary Anne! So great to have you joining in the fun with me again this year for my 12 Tags of Christmas challenge. Your idea of creating the 5x7 book is a great one - sort of an art journal. Love what you did for Week #1 - especially the mono printing with the stencil. I think that is so much fun! Love that Handle With Care stamp too - so perfect for this thee. Looking forward to what else you will be sharing with us this year. Thanks for the kind words about my shop too. This little fella is fantastic, all decked out in his holly and ivy. Oh my goodness, what a keepsake you are creating here! I looooove that you're making a book for after Christmas. That is such a terrific idea. The image and the stamps and paper you have chosen are certainly tops in the realm of vintage. This is going to look smashing!! Hi again, Maryanne! I absolutely love this first tag of the series! It's magical and so Christmasy!!! (is that a word?) I cannot believe that Christmas will be here before we know it. I love, LOVE this tag and thank you so much for sharing it with all of us!